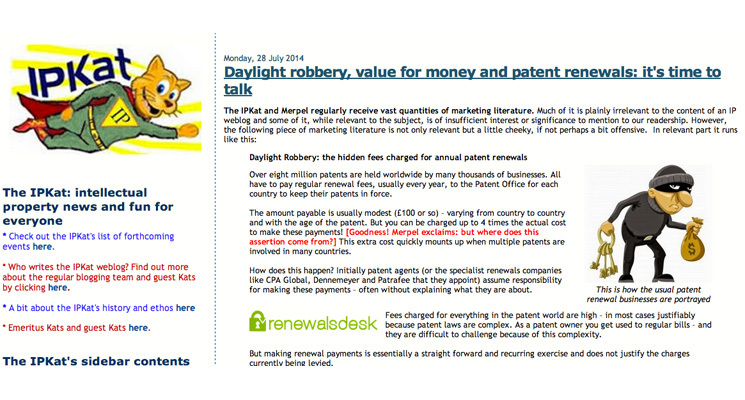 We were really glad to see esteemed Intellectual Property blog IPKat discussing RenewalsDesk and the hidden costs that some renewals companies charge to patent holders. One of the most discussed issues from the article is how you can be charged up to four times the official patent office fee by many renewal agencies. These figures were quoted to us by CPA Global and others as the fees they charge companies with small numbers of patents – usually 25 or fewer. In the UK, this accounts for a large proportion (over half) of patent holders. On this basis, take for example a large entity patent for Canada that is up for its fifth year renewal with CPA Global. In year 5 you’ll pay 2.5x more than the patent office fee and in year 6 – 10 you’ll pay 4x as much as the patent office fee. In year 6 – 10 the official patent office fee to be paid in GBP is only £59 (this fluctuates slightly with the exchange rate). But CPA charged £236.51. Even taking into account the cost of buying currency and fluctuating exchange rates, this is a big difference and it appears that a lot of extra fees are being bundled under the quote for the patent office fee. As another example take a renewal fee for a granted patent in year 4 – 6 for South Korea. The actual patent office fee, when converted into GBP (again fluctuating slightly with exchange rates), is around £23. But renewing with CPA Global, over 6x that patent office fee was quoted for the renewal: £143.85. (It should be noted that in South Korea and Japan many renewal agencies have to pay local attorney fees in the region).